Damage to any of these supportive structures causes the instability of the knee joint. This can be caused by sudden twisting of the knee, tears of the meniscus, ligament or capsule, osteoarthritis of the knee (wear and tear of the cushioning cartilage tissue between bones) and sports injuries. When these tissues get injured, the patella or knee cap can move out of its groove in the knee joint and lead to instability. 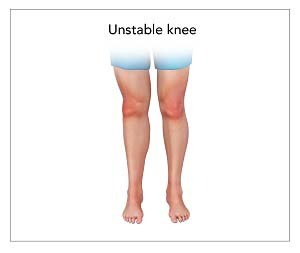 An unstable knee causes pain, swelling, stiffness and a tendency of the joint to buckle or "give way". When you present these symptoms, your doctor diagnoses knee instability by performing a thorough physical examination to test the stability of each ligament and may order imaging tests such as X-rays, MRI or CT scans to confirm the diagnosis.